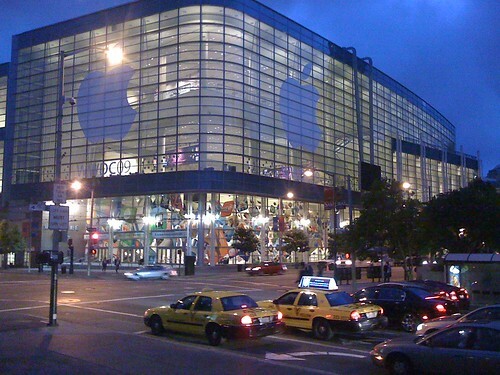 I'm currently in San Francisco for this years Apple World Wide Developer Conference (WWDC). However, unlike a lot of the big conferences I attend, I won't be blogging this one live. Apart from the Keynote on Monday morning, and the party on Thursday night, everything else going on here, including most of the content of the conversations going on in the hallway track, are under a non-disclosure agreement (NDA) with Apple. Published by aallan on Flickr. After over ten years traveling around the world racking up frequent flyer miles, and having set foot on every continent except Antarctica, you begin to think you're immune to culture shock. Posted to Flickr by aallan. 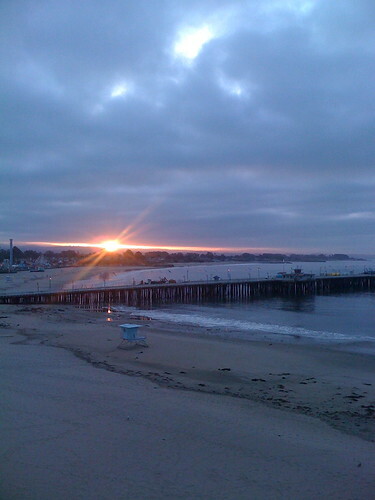 Sunrise over Santa Cruz Municipal Wharf. I know the best place to eat in more than two dozen airports. I know the hidden and totally unsigned walking route between the main terminals which keeps you airside at SFO rather than sending you back through security. I can speak fluent American as well as British English, or at least I can get the words right. My accent is unmistakable, and at least some of the time, an asset here in the States. I've stayed in some of the best, and certainly some of the worst, hotels in the world and I'm familiar with many of those little cultural taboos that catch out in-frequent travelers and cause difficulties. The sight of what appeared to be a cute soccer mom, with large sun glasses and a scowl on her face, driving a black sport utility vehicle with tinted windows, being pursued at some speed by six police cruisers with sirens blowing and lights flashing down Pacific Avenue here in Santa Cruz proved me wrong. Or rather the fact that I was the only one paying this incident any attention. The sight of one of the cops leaning out the window of the lead vehicle holding a shotgun wasn't apparently that unusual. The ambulance that raced by a few minutes later, heading in the same direction as the now long departed cavalcade of vehicles, didn't seem to be raising any eyebrows either. Of such small incidents, and other little things, comes the large and uncomfortable feeling of disorientation that tells you you're a very long way from home. No matter how many times you visit a country, and no matter how at home you feel there, there is always the possibility that culture shock will creep up on you unexpectedly. I'm currently at Mac Developer Network's NSConference. So what better time to sit down and write my next iPhone application? However abandoning the cloud computing theme running through my previous applications, I've gone back to my roots and written something for the astronomers in the audience. LookUP for the iPhone and iPod touch. I'll be submitting the application onto the App Store in the next couple of days as a free application. However if you want to get your hands on it sooner rather than later, after an extended time in the purgatory that is the Apple review process, I'm willing to generate a limited number of Ad Hoc distribution copies for interested parties. First come, first served. Update: LookUP for iPhone is now available on the App Store. I'm sitting in the closing keynote from this year's ETech. We've got "Freedom and Control: Lessons from China for the World" with Rebecca MacKinnon, "How the Magic Circle Transforms the Commons: Games, Communities, and Civic Participation with Kati London, The End of Free Space with Jane McGonigal and finally Viral Forecasting with Nathan Wolfe. She's talking how, while heavily censored, the Chinese web contains a great deal of political commentary which is arising virally where people are using stories, pictures and language to get around the censorship. The problem is that there is a opaque layer building up between the government and the citizens. The next speaker is Kati London talking about civic participation, and how we might be able to use games to engage people. Our penultimate speaker is Jane McGonigal with the results of Free Space, the 3 day massively-multiplayer thought experiment which has been going on at ETech, kicked off earlier in the week at Ignite ETech on Monday. How is it possible that a virus as devastating as AIDS sat in the human population since the 20's, spread around the world, and wasn't really detected until the 1980's. However the real question is, how do we avoid something like this happening again? How do we avoid something worse? We need to look at how viruses are entering the human population well before they become more than only weakly adapted to living in humans. A hacker space is a self-organized space where people share the rent, bring tools, and do different types of hacking. Until recently hacker spaces in the US were places where people lived, as well as worked, and there were negative connotations placed on them by the media. O'Reilly have been part of the drive to take back the word 'hacker', partly by associating the word hacker with the word maker. What are robotic cars? An autonomous vehicle that can drive on ordinary roads. They offer comfortable workspace, face-to-face, and they bring Moore's law to transportation, as soon as transportation becomes a software problem the pace of change will rapidly increase. They park, deliver and refuel themselves. Three new terms: robo-taxi, whistlecar and deliver-bot. The DARPA grand challenge competitions was surprising, teams with very small budgets came up with amazing results, despite the almost total failure of the first competition. When? Some technology is already here, many predict as early as 2020. But barrier may be more legal and social than technically. It does require breakthroughs, but noting compared to general AI. Needs cheaper hardware and heavily parallel hardware. Why is it such a great thing? Accidents, human drivers kill 45,000 people a year, over a million people worldwide are killed in traffic accidents, and far more people are injured. We also don't realise how much infastructure we've given over to cars, there are six car parking places for every car in the US. Self-delivery is almost as self-driving. Here we come to the robo-taxi (and the whistlecar which self-delivers but doesn't self-drive), which you summon and then takes you on the trip. The advantage is that you get the right vehicle for the trip. A 10-mile range electric trike allows you to pickup a truck or a van. Energy is today's hot-button issue, so lets look at the electric car. Who killed the electric car? Conspiracy theories aside, the battery killed it. People won't tolerate the cost, limited range, long recharge times and poor availability of fast recharge. We can make an efficient short-range cars, but people don't want them. Robots don't care how convenient recharging is, a robot car refuels/recharges itself and stations don't need to be on-route or close. This enables experimental fuels. You don't care about the range of your taxi, just that it will get your where you are going. A lot of suggestions for futurist transport have actually been around for 40 years, unlike a lot of these robot cars use the existing infrastructure and can be bought be private individuals, and crucially by early adopters and alpha geeks. No matter how attractive the centrally planned system sounds, it won't out compete a system that grows from the bottom. More advantages. No parking, no congestion, you can read and work in transit. You don't need a license and you don't need to own a car. It's cheaper and safer for accidents. That's by definition by the way, we' shouldn't allow them on the streets until they're safer for accidents than human driven cars. You can already buy a lot of this technology off the shelf, self-parking, auto-spacing cruise control, lane departure prevention, road side reading, auto-braking and coming soon from VW; lane following, passing and parking. We have to apply the School of Fish test, put a whole bunch of cars on a track and challenge people to drive amoungst them and crash into one. If the robot cars pass the test, people shouldn't be able to able to touch them, they'll just get out of the way. What will stand in the way? The law, fear of the unknown, liability, terrorists, the technological challenges. What about software recalls? What happens when your car gets disabled when the manufacturer issues a safety advisory on the current firmware. A lot of location systems work this way, they know the location of a fixed point, and they measure your distance to that point. To unambiguously locate you you need at least three reference point, the more points you have the more accurate your location can be pinned down. In practice of course you never know anything exactly, so even with multiple references point you always have a error. A GPS receiver measures the distance to a satellite by calculating the time it takes for a signal to travel from the satellite to the receiver. But what is the satellite's time? what is my time? A fourth satellite is needed for time synchronisation. But where are the satellites, precisely? As well as a time stamp each navigational message includes the position of the satellite and its path in its orbit, and a subset of the almanac - data about the other satellites in orbit, including a rough position. However the ephemeris (and the almanac) may be delivered via other mechanisms, e.g. backhaul via the cell phone network. For location technology there are many metrics, one of these is how long it takes to get a location fix. With GPS on a cold start it takes on average 23 seconds, with a warm start, where the time and ephemeris is still valid the time-to-fix is much less, around 4.2 seconds on average. Faint signals (-135dBm and lower) complicate decoding process and may cause the receiver to drop frames, increasing the time-to-fix. Typical GPS receivers need -140dBm or better, and cannot decode below -145dBm. Outside you normally get a signal from -125 to -130dBM. Inside in your home you get a signal from between -135 to -145dBM, however in a high-rise building the signal will go down to typically between -135 to -160dBm. Accuracy is very important, and there are many factors contribute to error, the most important is timing inaccuracy. One of the biggest problems is multi-path signals, the satellite signals bouncing off surfaces (building, planes, etc). End-user accuracy is typically 10-30m in a good area. That's not generally good enough, onboard navigation systems generally fix your position by assuming your car is actually on a road. Moving on to Wi-Fi positioning. There are hundreds of millions of access-points around, so it's easy to determine your location? Okay, but we need to trilaterate. We need the distance to at least 3 access-points and the exact position of the access-points. It turns out there is a quadratic relationship between the signal strength you receive and the distance to the access point. So in practice, distance to an access-point can be estimated by measuring received signal strength. The second problem is solved by driving, and walking around neighbourhoods, malls, campuses and collecting Wi-Fi signal fingerprints, then calculate each access-point's position by (reverse) trilateration. Conventional wisdom for the range of an access point is about 500ft, but some times they have much larger coverage, some over a kilometer wide. This can happen for many reasons, perhaps the signal is boosted, but perhaps the signal is just bouncing off water, or there was just nothing in the way to prevent the signal propagating. The access point might be in a high-rise building. The time-to-fix in network mode, where the client collects the Wi-Fi fingerprints, but the location is calculated remotely. However in tiling mode, where the client has a small portion of the database cached locally, and your location is calculated locally the time-to-fix can be sub-second. Accuracy, distance to access-points is only an estimate and we have unmanaged reference points, and access points do move. But many readings compensate. The end-user accuracy is typically 20 to 30m in good coverage areas. Next up is "Tales from Technomadia" with Chris Dunphy and Cherie Ve Ard. Chris and Cherie are talking about lifestyle hacking and technomadia.com. The basic trailer model they're using is from Oilver Trailers, who have taken some of their modifications and are now selling them as standard packages to other customers. They run with 2×100W solar panels backed up by a propane generator. This supports two MacBook Pros, a 24-incg monitor, a Mac mini set up as a media server and a 1TB of NAS. The tech is pretty standard, but it's all crammed into the trailer. More critical is connectivity, onboard is a "Mobile Command Center" signal booster and a EVDO to WiFi router, looks like the US equivalent to Three's Wireless Router back home. Other connectivity options: Satellite, Long Range WiFi and Internet Cafes. There are lots of options for home selection: RV, boat, train, backpack, airship(?) and cubesats(?). Family. You can take them with you, or you can have extended visits with them, and if you want to you can get really far away from them. Pets. A nomadic lifestyle isn't necessarily a bar to having pets. Stuff. The most common thing people say is "...I could never give up my books". It's incredibly hard but you can shed your stuff. Other excuses; job or career. There are jobs that can't be done remotely. But if you're a geek, you can probably do your job anywhere. So why are you commuting 40 or 50 minutes a day? It's not ecologically sound? They're arguing that they're using so little electricity and water now their footprint is much less than when they were living in Silicon Valley. If there is something you want to do, the best advice is just go. This isn't for everyone, but if it's for you, get over your excuses and go do it. In the early 60's Kennedy challenged the world to put a man on the Moon, and peopled rallied behind it, but it was scientists that went out and did it. You can argue about that the big issues are right now, but certainly one of biggest is the environment. In this challenge, of course scientists are going to play a role, but the solution is going to be much more driven by people. Eric is arguing that while we should be doing projects that can be provocative, or playful, but should be purposeful. We need to set our computing free, we talk about designing for disassembly, but what about designing for activism? Citizen science has a long history, well over 100 years, one of the longest running projects is the citizen bird count. Even though most people are pretty bad at this, wisdom of crowds tends to apply and remove the outliers, and the data actually turns out to be good on average. How hot is it in this room? Which direction is the wind blowing? Which direction am I facing? Is that water safe safe to drink? Is the carpeting treated with chemicals? Are my children's toys free of lead? There is clearly a motivation to have sensor-rich tools, mostly to improve the mobile interface, but the other phenomenon driving this is citizen driven content creation. I'm in "Urban Homesteading: The Rise and Fall and Rise of Modern Making" with Mark Frauenfelder of Make Magazine. The seven guiding principles for successful urban farming is to grow only useful things, region matters (a lot), build your soil, water deeply and less frequently (watering frequently encourages weeds), work makes work, failure is part of the game and pay attention (and keep notes). The computing element that is at the cutting edge right now is about the size of a chocolate bar, but following Moor's Law what happens when that gets down to a cookie. Thinking about the way we interact with things, what's actually good about this? There is a real problem with the way we interact with computers these days, we have to be pulled out of the physical world we live in and into a small box. Mobile phones make this problem worse, not better, we're pulled out of our environment and into an even smaller screen. How do we design an interface that better merges the physical and virtual worlds? What are the sort of things we use computers to do? Basically it boils down to problem solving, in the old days of punched cards the feedback loop when running a program was very long, these days it's shorter. However the way we interact with the problem is important. Objects that build the problem into their physical shape make it easier to solve the problem. Tangible computing, ubiquitous computing and gestural computing as well as table top computing and sensor networks are the major research trends that are important when we're considering how to interact with objects when the technology start getting smaller and smaller. This work has led to some work on multi-gestural interfaces. For instance grouping, Putting everything in the same group means that these are the same. Then there is gathering, you can't represent infinite amount of stuff with a limited number of physical items, so if you have a number of items that are grouped together you can pull them all into one siftables using a sucking gesture, and free up the other siftables to represent new stuff. Other gestures could include inclining, angling the two siftables towards each other to create and strengthen a link between them; angle them away from each other to weaken the link. Pouring, sending an attribute from one item to another. Queuing, place siftables in a line to create ordered list. Stacking is a similar thing. Siftables key features include a multi-person, information-centric collaboration around collections on a tabletop with three-day interaction. The siftables can come up off the table and be gesture sensitive. Finally we can offload working memory and mental computation onto the tool. First up is Chris Luebkeman who is reminding us that cities are for people and everything there is supposed to help people thrive. In Japan they're reaching peak urbanism, and they're facing the problem of what you disassemble in your urban environment when it's no longer needed. The population is also aging, you need to design your city to reflect aging urbanism. If older generations cannot cycle, what type of vehicle can they use to increase their reach and access? How do you create systems to allow you to be mobile for as long as possible. What should you e designing for ages 0 to 100? Cities are not designed for the abandonment of downtown, this has happened in Johannesburg where the centre of the city has been almost entirely abandoned because it was no longer safe to be there. Everyone has moved out to the suburbs. The modern bread line, how can you increase the resilience of our urban areas? Fuel is necessary for cities. While many of us, the digital elite, could continue to work if we couldn't drive. This isn't true for most people. If we're going to move towards an eco-friendly world, what are the things we should be doing. What should we not be doing? In the end of the day eco-cities are about reducing our impact, both as individuals, but also as a community. So the city of tomorrow, what is that? Well in the 1950's it was sky scrapers, and we did that. But we have to look and see what the drivers for change are now. If you plan cities for cars and traffic, you get cars, if you plan cities for people you get people. If you could cut and paste anything in and out of your community, what would it be? ...and amoungst much other good stuff he announced CC0 which is a license which tries to make it easier to put things into the public domain. Because oddly putting things into the public domain is actually quite hard. CC0 gives people who want to give up those rights a way to do so, to the fullest extent allowed by law. Once the creator or a subsequent owner of a work applies CC0 to a work, the work is no longer his or hers in any meaningful legal sense. Anyone can then use the work in any way and for any purpose, including commercial purposes, subject to rights others may have in the work or how the work is used. Think of CC0 as the "no rights reserved" option. Only possibly the last keynote of the morning, apparently there might be a surprise talk, is Christa Hockensmith who is talking about new uses for explosives. The usual uses for explosives; munitions, bombs. fireworks, explosive materials for the military, mining excavations, roads and demolitions. But there are more unusual uses; power tools, diamonds, polymeric tools and some more untested and off-the-wall ideas. Explosive assisted tools. Many tools are powered with hydraulic fluids or compressed air. Therefore compressors and fluid lines must be available at the site where the tools are used. Small explosive cartridges could be used instead. Although this tool is not in use, other similar tools are in use. We can use this idea for nail guns, spray guns, chipping tools and various other tools ordinarily powered with air or fluids. Explosive powered tools can also be used to give easier access to inaccessible recreation or search sites. An explosive-powered pin insertion tool could be used in rock climbing or rescue operations. Explosive-aided polymers. Polymeric materials are used as a coating around other chemicals that are to be delivered during a manufacturing processi. Small explosive charge ruptures the polymeric exterior coating freeing the chemicals for delivery at the appropriate place and time. Polymeric coating protects the deliverables and increases shelf life during storage. Untried and untested. A large explosive can create industrial diamonds, what about very small explosions? Very small detonations that implode rather than explode the tumor may prevent uncontrolled bleeding and the body will clear the debris. Even smaller detonation may clear plugged arteries and blood vessels without running balloons through those vessels. I'm in "High-Tech Chocolate: Reinventing the Path from Pod to Plate" with Timothy Childs and Maribeth Back who are talking about what happens when high-tech chocolate company meets high-tech research lab. ...they've also come up with the flavour lab, not flavouring the chocolate, but coaxing flavour out of the raw beans. They're also encouraging the farmers to cook beans better, and dry them properly, and letting them charge THCO more for it. But they get better beans and better chocolate as a result. They've investigating in remote sensor networks and they're able to monitor conditions in Perudirectly, they know how the beans are fermenting, and they're starting to build models based on this data and the taste of the resulting chocolate. Timothy is demo'ing the iPhone application developed for them by FX PAL which allows them to monitor and control the factory in real time from their phones. Interesting stuff, and oddly the UI they've developed for the application mirrors some of the interface stuff I've been doing for controlling autonomous telescopes networks from the iPhone for the eSTAR Project. During a time when people have less money in their pocket, they taper off their spending, and go out and get things fixed rather than buying new ones. The question is will this continue? There are signs that this time round, perhaps, it might. They're talking about design patterns for post-consumerism. The world simplifies down into two kinds of people; back to basics and and the progressives. They argue that the back to basics days are behind us, there isn't any way to drag the world back to the days before the plough. 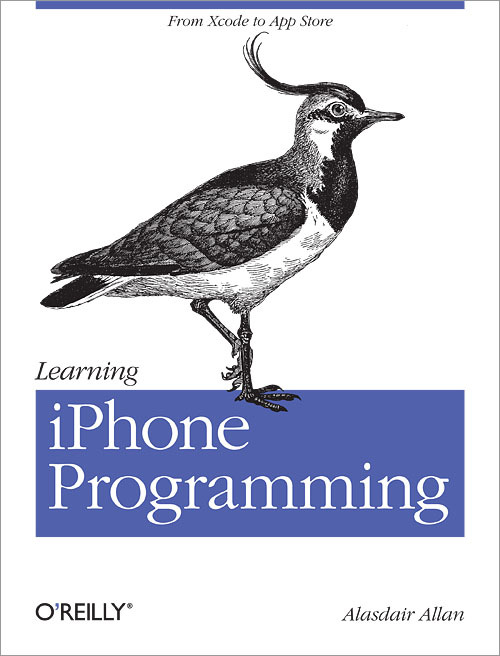 Design Pattern 1 is free. It's gotten a lot of press. This is free as in speech and as in beer. This isn't giving away the razor to sell the razor blades. If we can create an economic and cultural value around free that's more than the economic value again they that's interesting, and open source culture is pointing us in that direction. Obviously capitalism isn't going away, but it is shrinking. Design Pattern 2 is the repair culture. Things should be built to last, and when they are, oddly enough people actually want them to last. People take care of them. If you build objects that are built to be disposable, people want to do just that. We've shed a lot of the repair culture in our pursuit of innovation. But we can innovate by extending the lifespan of our products. Design Pattern 3 is reputation scaled. You can argue that reputation is the fertile ground that civilization comes from, but the problem is that this worked best at the level of the village. The transformation event from the village, to the global economy to the global village, where reputation is traded on and important once again is really important. Design Pattern 5 is virtual production. This is where stuff gets made, and stuff gets sold, but it's all digital. Digital goods are replacing physical goods. Our interfaces are getting so good these days that we can replace physical products, you only have to look at virtual spirit level applications for the iPhone. For a 2.5kg Mac laptop, you have a 460kg CO2e. Moving on to possible future scenarios, the most optimistic is efficiency + technology where we have rapid innovation in energy efficiency technology to create a consumerist, low carbon world. here society is increasingly dependent on technology and is delicately balanced. Next is the service transformation, here high-carbon prices mean business sell services, not products. The next is redefining progress, people have to rethink what a fulfilling life means. Meaningful jobs are valued and stronger links with local communities are cultivated. The next step is slightly darker, we've left it too late, this is the environmental war economy. Governments are forced to rationalize whole sectors and take control of citizen's lives. Environmental refugees must find countries willing to accommodate them. Finally, where we actually just end up in a projectionist world. Countries wage war over resources. The 20 largest cities in the world use 75% of the world's energy, and 500 million more people are predicted to move into cities over the next five years. The current prediction is that the future population is going to be concentrated in many, but smaller, cities.